Jamón Ibérico is one of the most exclusive and sought after charcuteries in the world. But it can be confusing when presented with the various Spanish Jamón options. So I’ve put together a guide to help you understand more about what you’re eating, where it comes from, how it’s produced and where you should be buying this most magnificent of meats. Enjoy! 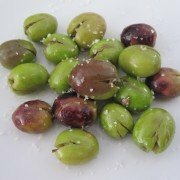 It’s the healthy fat of the oleic acid-filled acorns eaten which marbles the meat, giving it the unique sweetly nutty flavour and melt-in-the-mouth texture. 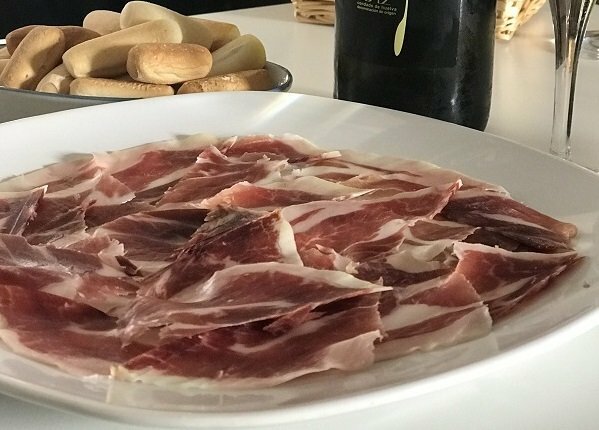 You should be able to stand a freshly sliced plate of Jamón Ibérico de Bellota on its end and the Jamón won’t fall because the soft fat sticks to the plate. When I first came to Spain I was always pulling off my fat from Jamón because I was brought up to believe that fat kills. My Spanish friends, like vultures, would grab it from me. It took me a while to get my head around the fact that the fat from Jamón Ibérico is good for you – it is a healthy fat. You can put it on your tongue and it literarily just melts away. 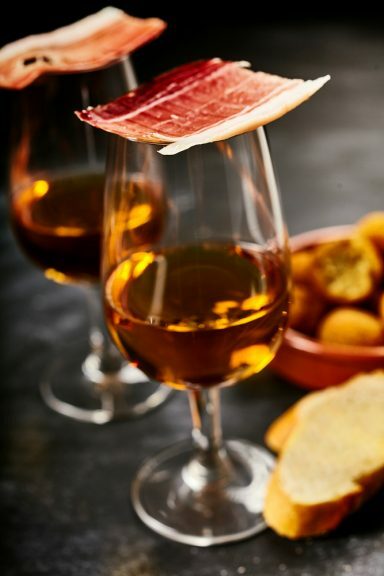 The oleic acid from the acorns creates good cholesterol, making Jamón Ibérico de Bellota a health food – sought after by gourmands and health freaks alike. Jamón 100% Ibérico de Bellota: this is the finest, from 100% pure-bred Iberico pigs that have eaten only acorns during the final period, the montanera (the acorn season). Jamón Ibérico de Bellota: this is not pure-bred but have to be 50-75% Ibérico . They too have fed exclusively on only acorns during the montanera. Jamón Ibérico Cebo de Campo: These pigs have to be 50% Ibérico but are fed mainly on grain with a few acorns added. Jamón Ibérico de Cebo: Again, these pigs need to be 50% Ibérico, but they are not free-range and they eat only grain. I used to think that 100% Ibérico de Bellota signified that it had eaten 100% acorns but it does, in fact, mean that it’s 100% pure Iberian pig. 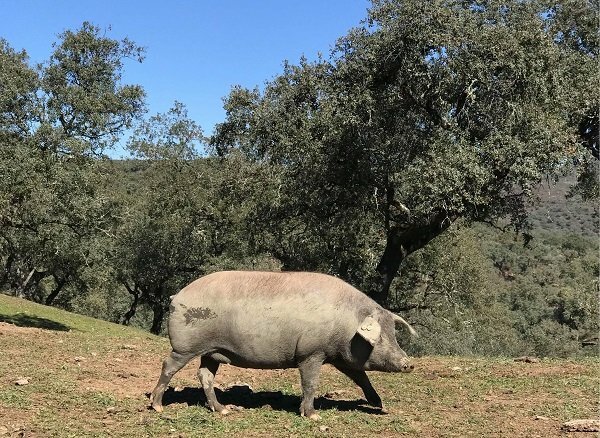 Both the black and red labels have eaten acorns during the final four months of their life, roaming free-range across dehesas (oak-covered farmland). But the black is pure Iberian pig, while the red is a blend of Iberian and Durco, the pink pig. It should be noted that Jamón is the back leg of the pig; Paleta is the front leg. Both are cured in the same way but the Paleta for less time at each stage as it is smaller. Prior to refrigeration, one of the few ways people had of preserving meat was using salt and air – salt to extract the moisture and air to dry it out. History tells us that the Phoenicians and Romans both preserved pork in Spain in this manner. 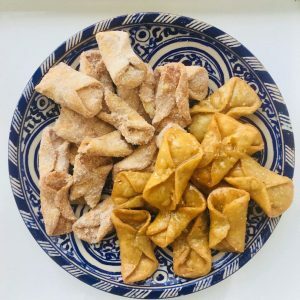 The mixture of the native pigs, local salt, the acorns and the dry winds of the dehesas (cork forests) produced this unique delicacy, until the 700-year occupation of the Moors when all pigs were banned. 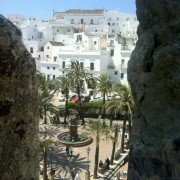 Following the Reconquista in 1492, Isabella and Ferdinand filled the area of Al-Andaluz with pigs, making sure that any masquerading Muslim or Jew would have no meat to eat. It became fashionable to have a Jamón hanging at your window as a sign you were Christian. This made pig farming and pork popular again. 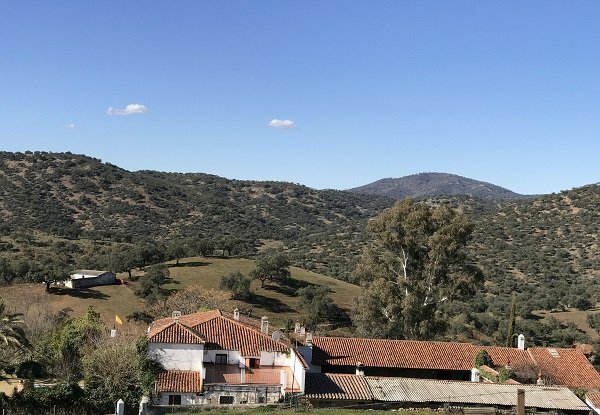 Just as the Sherry and Mojama (air-dried tuna) of the area rely on the winds for air drying, the hilly areas of the dehesas of the Jamon production zones offer similar dry winds required to preserve food following salting. Jamón Ibérico has been a delicacy in Spain for many years but was a latecomer to the tables of those outside Spain. It was only in the 1990s, after formation of the EEC, that it became legal to import Jamón Ibérico into member states. It wasn’t until 2005 that USA then allowed importation. 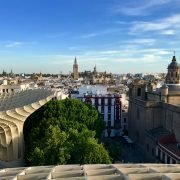 Where Does Jamón Ibérico Come from? One of the key regulations is that each pig has dehesa space the size of a football field through which to roam freely. 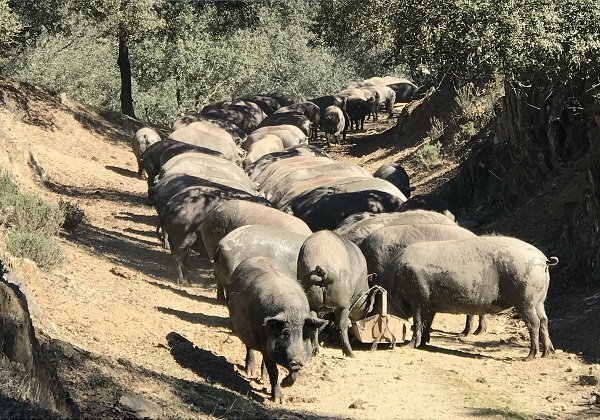 So if you have 300 pigs you must have a dehesa the size of 300 football pitches. Even though the pigs are all in the corner of one, it’s still the roaming area required by the DO. There are other Jamón producing areas of Spain such as Teruel and Trevelez giving us Jamón Serrano from the pink Duroc pig fed on normal pig food. 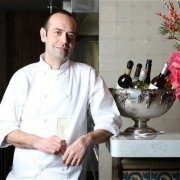 Serrano lacks the magic fat of Jamón Ibérico. 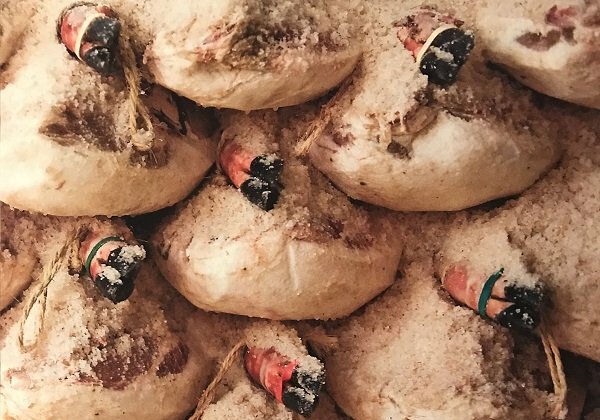 Top producers to look out for include Joselito, Jamones Eiriz and Embutidos Fermin. 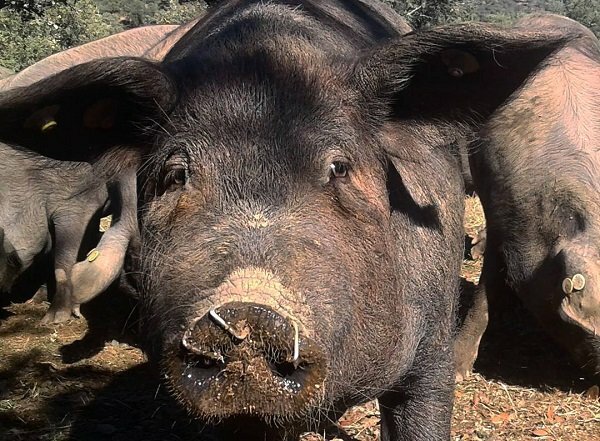 March: The 2½ month old pigs arrive with the porquero (pronounced ‘porkero’ – pig farmer) mid March, weighing an average of 2.5 arrobas* each (30 kilos). They are then inoculated, snouts ringed, ears tagged with chips containing the history of their breeding and then branded to stop any becoming lost amongst a neighbour’s herd. For pure 100% Cerdo Ibérico, breeding is normally done using artificial insemination. The gestation period for a pig is three months, three weeks and three days. They are then sent out into the dehesas where they immediately munch their way through the remaining fallen acorns of the season. 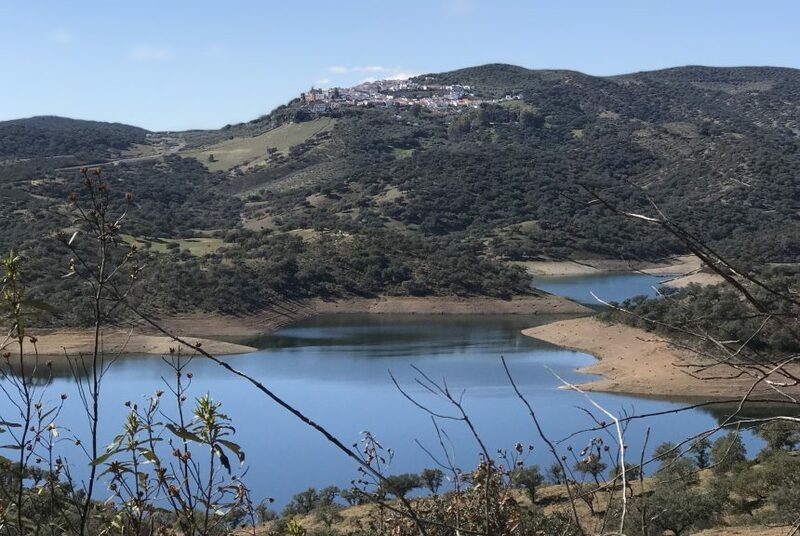 By this time, the winter rains have left the dehesas filled with grass and foliage providing enough food until the beginning of June. 15 September: The pigs are sent back out into the dehesas, still being fed on pienso. October – February: The Montanera – 4 months of acorn feeding commences. Acorns make them grow fat and each pig can easily gain 20 kilos per month. This is critical because, to go to market, each pig much weigh a minimum of 150 kilos. Acorns make them thirsty, too, so the farmer sets the water higher or lower so that the pigs have to use their legs to get up and down to the water, causing the fat to move between the muscles. February: Now 14-15 months old and weighing 150 kilos following the montanera, the pigs head off to be ‘sacrificed’. By law this has to be done in a legal slaughterhouse, never at the pig farm. 10-15 days of temperature-controlled salting: Jamón and Paletas are stacked hundreds deep with layers of salt in between. They are turned during this process so that those at the bottom of the salt mountain also spend time at the top. Paletas are smaller and require less time. 100-110 days of artificial drying: After washing they are hung in a temperature-controlled drying room. What they are looking for here is the certain start of the mould. If there’s no mould, something has gone wrong. 8 months of natural drying: They are then moved to open cellaring controlled by opening and closing windows allowing for increased mould. They are manually rotated so all get an equal exposure to the air. After which the mould is cleaned using sunflower oil and the Jamón make their way to the main cellar. 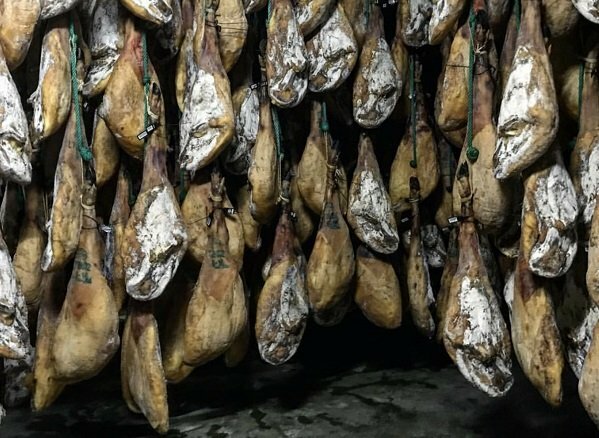 4-5 years of hanging silently: The hams are hung in the natural but less breezy air where they start to sweat a little in the constant temperature of the cellar. Here they are cleaned once a year with sunflower oil and again rotated from top to bottom. The calador (Jamón master) will insert a cala, a thin veal bone, into the Jamón and then sniff it, to check the maturation process. He will know by picking up certain aromas when the Jamón is ready to be released. Jamón 100% Ibérico de Bellota: Whole Jamón – €35-40 per kilo, sliced pre-packed €100-110 per kilo. Jamón de Cebo de Campo: Whole Jamón €25 per kilo, sliced pre packed €62 per kilo. Jamón de Cebo: Whole Jamón – €21 per kilo. Jamón Serrano: Whole Jamón – €15 per kilo. Jamón Ibérico is the most typical tapa of Spain. It is also one of the most expensive, so it’s a real treat. Almost always sliced in the bar in front of you, expect to pay €22 for a ración (plateful). Served with picos (little bread sticks) and a copa of Fino Sherry it’s my moment of bliss. 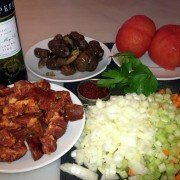 It’s also great with a beer or a fresh white wine. In Huelva we were served a local white wine made from the Zalema grape. It is often served as a starter along with plates of cheese and prawns, too. You do not need to keep Jamón in the fridge. You will never ever find them in fridges in Spain – just hanging in bars and restaurants. Keep in a coolish place in your house. If sliced, keep in a tupperware container. Where Can You Buy it Online? Enjoyed my introduction to the very finest Spanish ham? 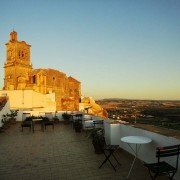 Find out more about my new Jamón tours.